» A CITY man going to the country puts too much in his house and too little in his ground. He drags after him the fifty-foot lot, soon the twenty-five-foot lot, finally the party wall ; and the homemaker who fully appreciates the advantages which he came to the country to secure feels himself impelled to move on. Label: » TAFEL XIII a RECHTECKIGE HÄUSERBLÖCKE FÜR DIE PRAIRIE-GEMEINSCHAFT. S. Two and three room apartments for men. T. Two and three room apartments for women. V. Seven and eight room houses, better class. Explanation for Img. _05 Scheme C.
» […] Each of the four houses moved to exterior angles of the four lots of the sub-block — grouping uniformly in fours equally distant from each other both ways, garages at center. Each group connected by low walls about eight feet [2,44 m] back from public walks. Major area of each lot suited for private use as a garden. Aware of the design's "inadequacies" see lot dimensions in terms of lacking a clear vision [apart applied pragmatism with a branding design twist X.) 19], Wright, [being the perfectionist perceived and therefore] eager to eradicate that flaw, refined his initially vague ideas until he shaped an urban vision that ultimately would become [worthy of] HIS. A view projected with hindsight. Profoundly visionary urban conceptions weren't an issue [yet]. The city club project was a deliberate statement directed at [even tailored for see: KEY TO PLAN] a sophisticated audience engaged in a very particular socio-urban conduct. VII.) VIII.) Wright intended to impress The City Club [on their terms], and he certainly did. 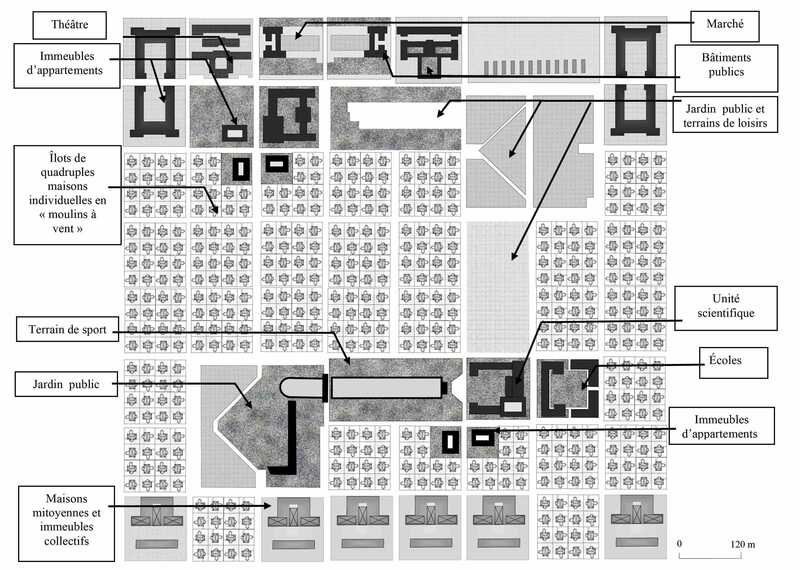 and b) target-group-specific tunnel vision: When reasoning the matter, we [including myself] simply overexpose this urban scheme as a [chronological] prototype for Broadacre City. This version of the Roberts project Img. _03 features 87' 3'' x 81' lots [approx. 26.6 x 24.7 meter = 657 m2] premising a 367' x 750' block. In view of that "picturesque variety" II.) 5 Wright intended, houses and lots [following the Chicago City Club project] turn out to be VERY X.) 19 SMALL, at least compared to today's aspirations. 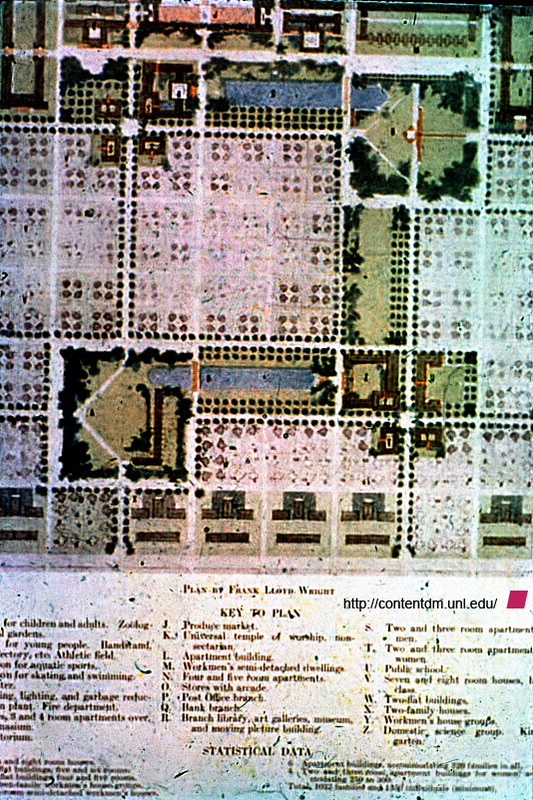 The Quadruple Block Plan [based on the reproduction used in Img. _02] also suggests that quadruple block lots were NOT quite square, depending on their "side-alley" XII.) 22 widths. "Figure 2-9. 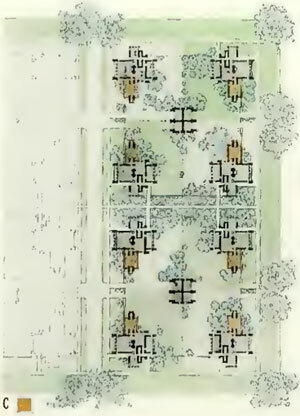 Typical unit residential area, Chicago, IL (APWA, 1968)." +41° 56' 34.65", -87° 46' 52.53"
According to various [net] sources the average [hence prevailing] Chicago lot size currently [still] equals 25 x 125 feet [7,6 x 38,1 m]. 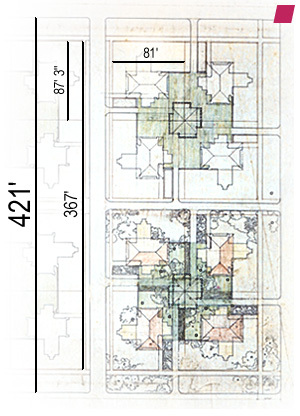 Label: » QUADRUPLE HOUSING, EXTERIOR PLAN « providing: » ONE ACRE GARDEN « for each house, thus depicting an area of 4 acres [16187 m2]. 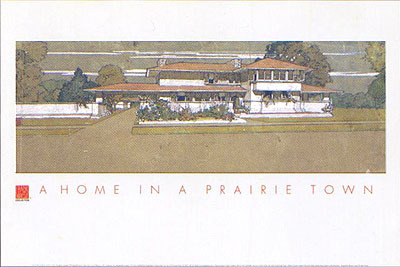 1 a » A Home in a Prairie Town « Page 53 shows a reproduction […] of the February 1901 article in "The Ladies' Home Journal" [http://www.steinerag.com/ 2]. Wilhelm Bernhard was awarded first prize, Arthur C. Comey second, Albert and Mrs. Ingrid Lilienberg third. 43 plans were submitted, 39 reported by the jury, 33 [including Wright's] published. A. Quadruple re-subdivision of city block by means of single cross street and parterres into four sub-blocks. 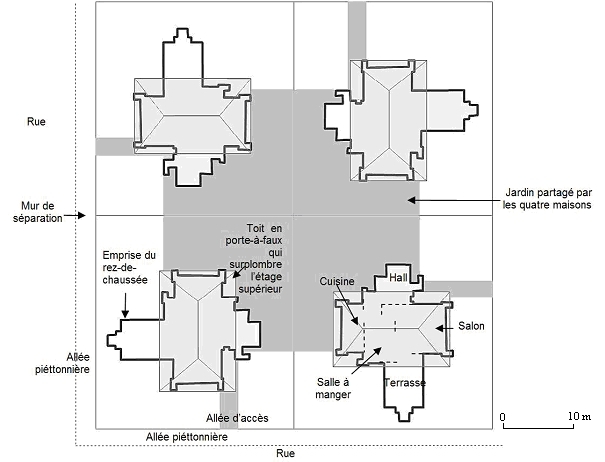 Four houses grouped at center of each sub-block about an interior court enclosed by low walls — 1/4 of the enclosure available to each of the four houses. One entrance to one house only on each side of each sub-block. 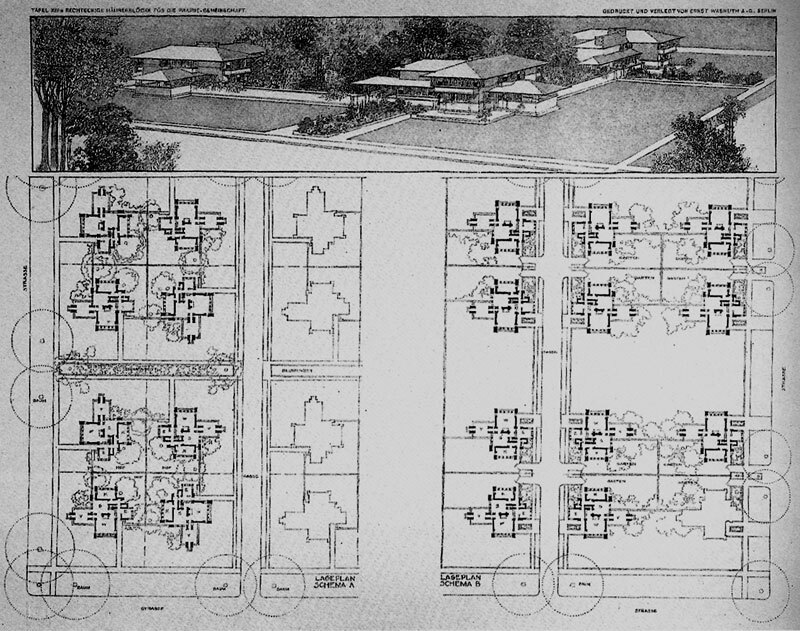 No alleys — houses revolving in plan so that living-rooms and verandas face outward and kitchens inward to courts. A single plan used thus is always presented at a different angle in harmonious groups of four. 7 The Seventh National Conference on City Planning [Detroit June 1915] provides a brief history of Chicago block sizes. Block sizes of 270 x 600 feet - based on graphic approximation to the site plan Img. _04 and competition guidelines - are [strictly speaking] speculative as are relating / resulting lot dimensions of approx. 64 x 60 feet [approx. 360 square meters]. Nevertheless: the site plan does indicate lots nearly half the size of the Roberts scheme. Img. _10 Thus houses with gross floor areas of let's say ~170 m2 at ground level would leave 6 m of open space between them, houses with ~121 m2 would have 8 m distance … a hypothetic 1:1 ratio of solids and intervals limits constructed areas to ~90 m2. 23 a b c Page 73; Note 26 resolves the procedures regarding the Chicago City Club Housing Competition. Img. _03 [page 20] Label: » TAFEL XIII a RECHTECKIGE HÄUSERBLÖCKE FÜR DIE PRAIRIE-GEMEINSCHAFT. Img. _02 [page 19] Label: » TAFEL XIII PRAIRIE-HAUS FÜR DIE PRAIRIE-GEMEINSCHAFT.